Reviewed: Marvel Now! Captain America ARTFX+ Statue by Kotobukiya | 'TAIN'T THE MEAT… IT'S THE HUMANITY! Kotobukiya’s collection of pre-painted statues featuring The Avengers continues with the Sentinel of Liberty himself, Captain America. The Japanese manufacturer’s Marvel Now! 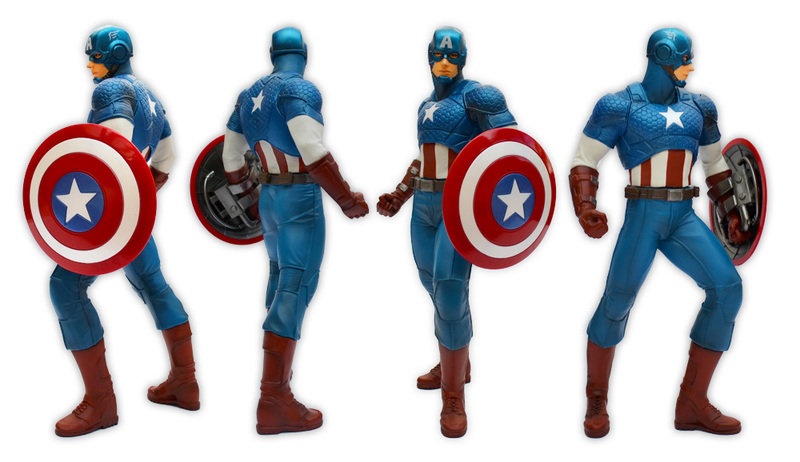 Captain America ARTFX+ Statue was released a few weeks ago, and is the third of six snap together model kits based on artist Adi Granov’s interpretation of the superhero team from the Marvel Now! relaunch of 2012. 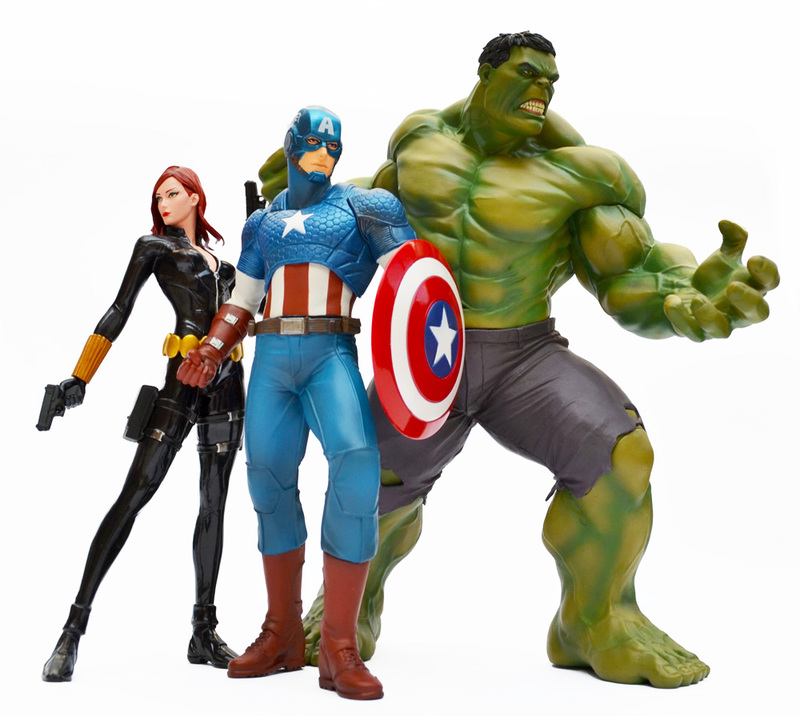 The first statue, The Hulk, was released earlier this year (click here for my review) while The Black Widow was released a couple of months ago (click here). This seven and a three quarter inch (or 1/10 scale) model kit comes in four pieces – head and torso, arms, and waist and legs – and is supplied pre-painted. No glueing is required to assemble the model/statue as the pieces snap together quite firmly. The seams in Cap’s armoured vest masks where he arms attach in their sockets, and although there is a slim gap where the torso and waist connect it’s hardly noticeable. 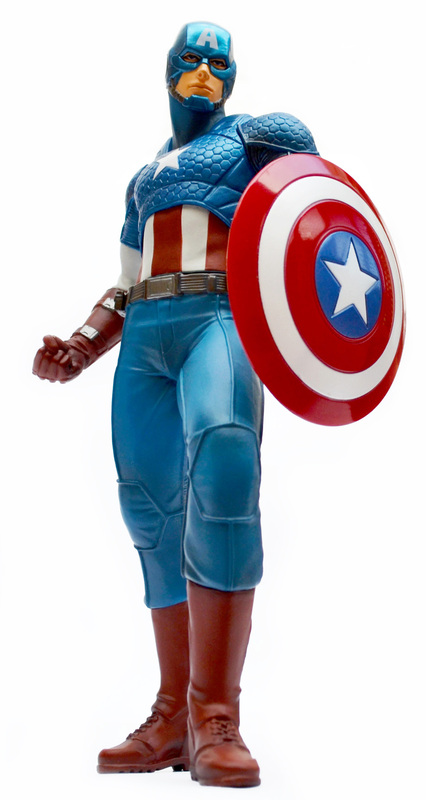 And since this is Captain America the statue comes with his iconic shield, which comes attached to his left hand. As with the other two statues Captain America ships with a plain square black base. The base is magnetic and clearly meant to hold the statue in place but it’s dull nonetheless. It’s a pity Kotobukiya didn’t print some road markings on the base or give it a gravel effect. 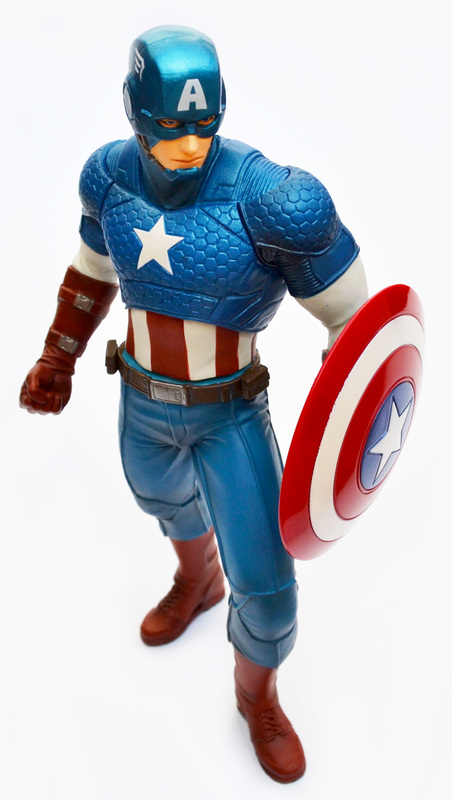 And unlike The Hulk and Black Widow statues – which stand perfectly well without their bases – Cap is a little wobbly on his feet. This appears due to his right boot not being perfectly flat – the statue will stand unaided but it is prone to falling over. 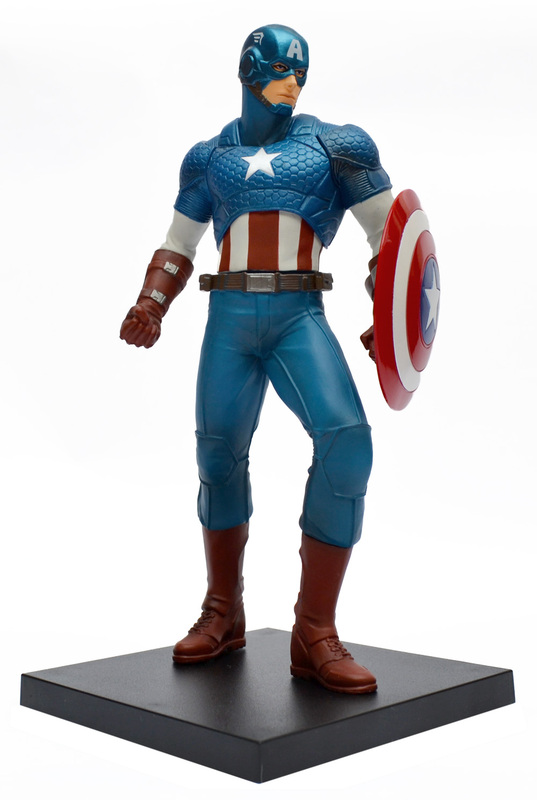 Thankfully Cap’s wobbly foot is the only blemish with this statue which, like its two predecessors, looks great. The paintwork is very well done (particularly around his face) and the colours of his uniform are rich with some subtle changes in shade. The moulding is also very well done with attention being given to the silver buckles on his wrist and the scales on his vest. Finally I really like the level of detail on his shield clasp – it’s nice to see Kotobukiya pushing out the boat on a detail that can only be seen from behind. 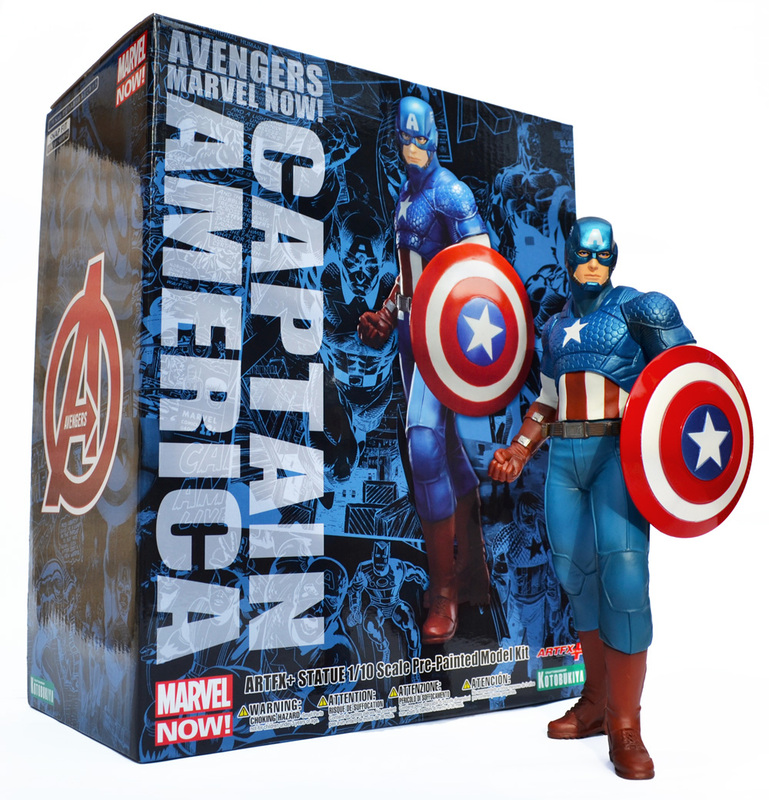 The Captain America ARTFX+ statue retails for around £/$45, which is remarkably reasonable considering the high level of craftsmanship. Anyone planning on getting one for themselves would be advised to act quickly – even though the model has only been out for a few weeks its value has already begun to climb. 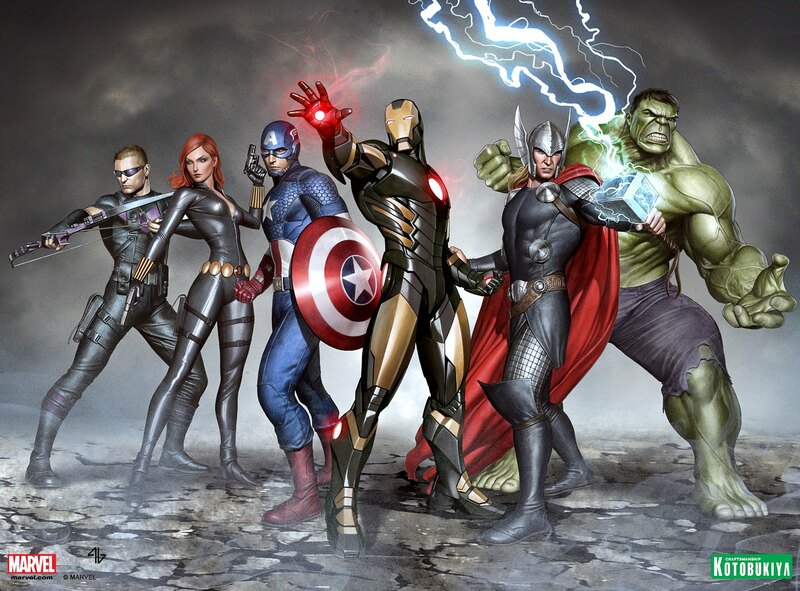 Kotobukiya are releasing the remaining three statues based on the other members of The Avengers – Hawkeye, Iron Man and Thor – on a rough six-week schedule throughout the remainder of 2014. The next statue – Hawkeye – has just been released and I’ll post some images when my copy arrives (click here).